Two of the world’s elite dressage riders came to honour the achievements of volunteers from the region’s Riding for the Disabled Association at the annual conference and awards ceremony in October. 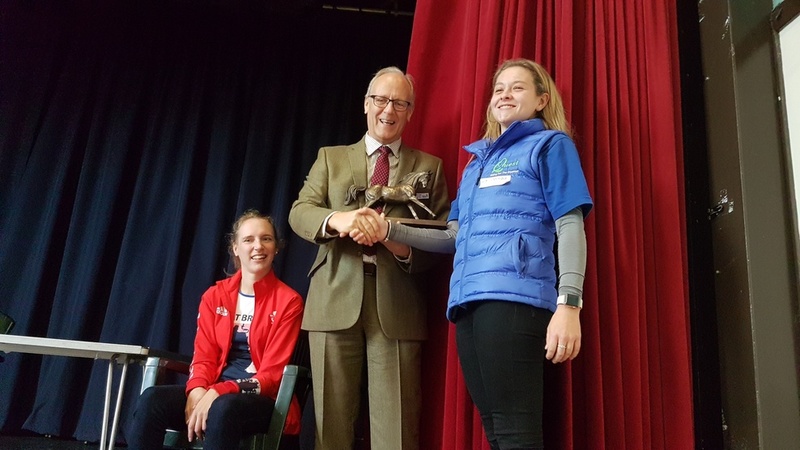 A record-breaking turnout from across four counties were treated to presentations from Paralympic Gold Medallist, Sophie Christiansen and International Grand Prix rider and world class coach, Sarah Sjoholm Patience. Nearly 150 delegates also enjoyed workshops and talks from David Mortlock from the Worshipful Company of Wheelwrights, Emma Bayliss from RDA UK’s national office who talked about the Tracker System and participant Sally Jones of Kipling County who outlined her path through RDA in both carriage driving and riding. There was also the annual presentation of the regional awards by the presenters, as well as a new award from regional sponsors, Cowan Architects, in recognition of the Young Volunteer of the Year, the Cowan Challenge Trophy. Cowan Challenge Trophy for the Young Volunteer of the Year – Georgia Budden from Quest RDA (Chobham, Surrey) who has shown total commitment and helped out in the holidays with extra chores, always being the first to step forward and offer to help. Young Volunteer Hebe Award – Emily Heyman from Cobbes Meadow RDA (Chartham, Kent) for being a loyal member of the team, giving her time twice a week to help with both riding and driving. Participant Titan Award – Helena Burgess from Chalkdown RDA (Staplehurst, Kent) suffers with Ehlers Danlos Syndrome and a range of additional disabilities that leaves her with constant pain and chronic fatigue. She has been a determined, brave young woman who has blossomed and grown. Participant Titan Award – Freddie Lamb of Quest RDA who has Aspergers and hypermobility. He has worked really hard to improve his riding while always smiling and his confidence has grown tremendously. He raised £500 for Quest by completing a 2 mile sponsored ride. Special Recognition Trophy – Julie Jones of Quest RDA in her role as chair for a group that has expanded the number of ponies and places that it can offer following substantial fundraising and leadership. Horse of the Year – Sinatra from Epsom RDA (Surrey) who is a favourite because he just strides out and enjoys his work. Buchan Bobby Award – Hope in the Valley RDA (Plumpton, East Sussex) which has had a stellar year, celebrating their 50th Anniversary with a Royal Visit, sending two riders to the RDA National Championships and giving up one of their riding sessions to act as ambassadors to the RDA with a Countryside Challenge demonstration to 160 Trefoil Guild Members at Firle Place in East Sussex. Volunteer of the Year – Pauline Roestenburg of Chalkdown RDA who took over the Chair two years ago and has transformed the group’s impact on the local Kent community, doubling the number of volunteers, adding to the Trustees and overhauling the finances into a healthy cash surplus. Legacy Awards – Vernon Roper, Long Furlong RDA (Pyecombe, West Sussex) should have received his 25 years long service award but died leaving an impressive legacy of energy and enthusiasm and Janet Bettell Higgins from Kipling County RDA (Chalvington, East Sussex) who was another legend, loved by so many whose lives she touched.